I probably should have blogged about these before I started my one year austerity challenge. Anyhoo, you may remember that I started them when I was a passenger on a six hour drive to the ski fields but I couldn't finish them on the way home because I broke a needle. None of this yarn featured in my last post. The pattern was designed by Australian designer Ambah O'Brien. I 've knit a few of Ambah's patterns before and love her use of simple lace patterns . I also suspect she loved stripes almost as much as Michelle does. 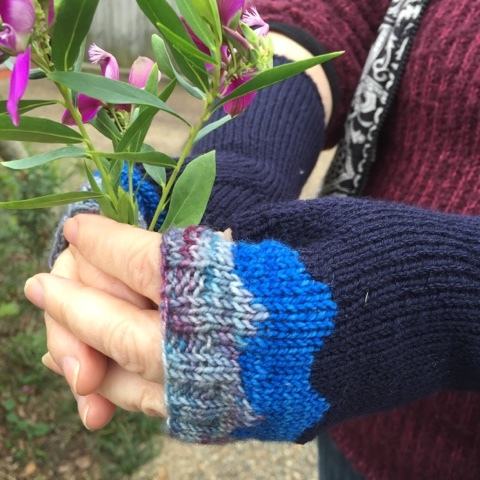 The mitts are finally finished and have been gifted to my work mate who has been happily typing away with warm hands. I like the stripey scallop pattern. You are rough with your needles aren't you!